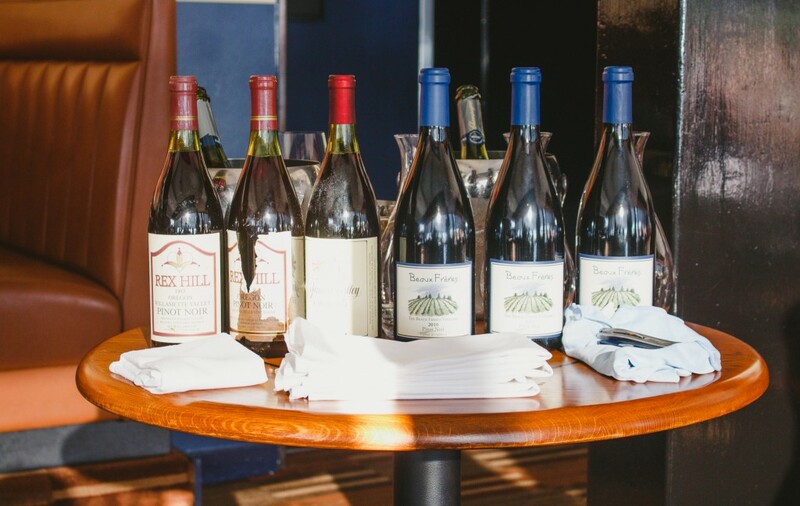 We are thrilled to have Carrie Kalscheuer, Director of Sales & Education for REX HILL and A to Z Wineworks at Ray’s Boathouse on Tuesday, March 27th for a beautiful four-course wine dinner. She will share with us the groundbreaking work that these wineries are engaged in; making both stunning wines as well as forging an organization entrenched in social and environmental care. I was lucky enough to spend some time in Willamette Valley, Oregon this summer tasting the wines produced there and learning about the storied history and success behind REX HILL and A to Z Wineworks from Carrie. The hospitality they showed me was only second to the quality of the wines. We look forward to showing you the same hospitality at our wine dinner on March 27th! Our Executive Chef Paul Duncan has teamed up with their winemakers to create a custom, four-course menu featuring the iconic cuisine of Ray’s Boathouse with six award-winning wines from REX HILL and A to Z Wineworks. REX HILL winery has recently been awarded an ‘Extraordinary Winery Award’ for being an ‘Under the Radar Winery’ from Robert Parker’s Wine Advocate, an accolade that recognizes REX HILL as a winery “poised to become the next-great-thing” in the Americas. The A to Z Wineworks company, which includes the brand REX HILL, led the way in becoming the first Oregon winery to become a certified B Corporation in 2014. This distinction recognizes organizations that meet rigorous standards of social and environmental performance, accountability, and transparency. If you have any allergies, please contact us to ensure we can accommodate. Price is $115 per person (excluding tax and gratuity). Dinner will run from 6:30-9:30 pm in the downstairs Boathouse overlooking Shilshole Bay and the Olympic Mountains. Seating will be communal and convivial. All reservations can be made by calling 206.789.6309 or rayscatering@rays.com. A credit card will be needed at the time of the reservation to reserve your spot. Even though March is Taste Washington Wine Month and we’re featuring some stunning local Washington wines at Ray’s Boathouse, we didn’t want our wine-loving neighbors down south to be forgotten! Sip & Savor Oregon Pinot Noir this Fall at Ray’s! Welcome to Fall at Ray’s! As the seasons start to change, we find ourselves at Ray’s looking for wines and flavors that capture this unique time of year. And nothing encapsulates the change of season quite like pinot noir. The bright fruit flavors and acidity of pinot noir pair perfectly with a variety of seafood, but one of the most ideal is wild, fresh salmon. We have the privilege here at Ray’s to be in such close proximity to one of the greatest pinot noir regions, the Willamette Valley, just four hours south. This September we will be showcasing a variety of pinot noir wines from the Willamette Valley in both the first floor Boathouse and upstairs Cafe. We recently had the opportunity to visit with Rex Hill Winery and A to Z Wineworks and discover how these beautifully crafted wines are created. First off, the teams at both wineries really took care of us, our wine glasses were certainly never empty. But, seeing the joy and dedication that the Willamette Valley wine community has to perfect each an every bottle of wine was truly humbling. The care that they have for their land and the product that’s sourced from it, reminded us of how we at Ray’s are committed to always sourcing the freshest fish and using local seasonal ingredients to create flavorful and inventive dishes for all of our guests to enjoy. So, this fall take advantage of all of the beautiful local offerings that the Pacific Northwest has to offer. Come into Ray’s Boathouse or Cafe to try a variety of our featured pinot noirs by the glass or bottle with your next meal. And if you’re not quite sure which one of these delectable wines to partake in, have one of our sommeliers help you find your next favorite pinot! Make your reservations today! For the Boathouse call 206.789.3770 or click here. For the Cafe call 206.782.0094 or click here. Ray’s loves Oregon Pinot Noir! At Ray’s Boathouse & Cafe we are honored to work with so many great people in our local food and beverage community. For decades we have partnered with and supported our friends at Rex Hill Winery, a winery that has been crafting elegant Pinot Noirs since 1982 in Oregon’s Willamette Valley; and we are proud to have been the first restaurant in the area to carry their impressive wines! Recently we had the privilege to host some of our friends from Rex Hill Winery (Carrie Kalscheuer), A to Z Wine Works (Annette Larson and Rick Vehrs) and Click Wholesale Distributing (Greg Giere and Dee Torres) for a fun gathering in the Boathouse to share and taste some delicious Pinot Noirs dating back to vintages from 1983! 1983 Rex Hill Pinot Noir – Rex Hill’s first vintage! Join us this summer in the Boathouse to enjoy a glass (or bottle) of Oregon Pinot Noir paired perfectly with our Copper River Salmon specials, as we’ve been expertly executing for more than 30 years!